Lech Wałęsa born September 29, 1943) is a Polish politician and a former trade union and human rights activist who served as President of Poland from 1990 to 1995. After working as a car mechanic and servind two years in the army, Wałęsa became an electrical technician in the Gdańsk shipyards in 1967. His rise to prominence began during the 1970 strike. However, it was after losing his job in 1976 that he emerged as leader of the movement demanding better working conditions, the right of free association and civil liberty. In 1980, he became a co-founder of Solidarity (Solidarność), the Soviet bloc's first independent trade union. Following 18 months of imprisonment, he returned to the docks as an electrician in 1983, winning the Nobel Peace Prize. The pro-democracy movement in Poland had attracted international media coverage, which made Wałęsa's face a symbol of the struggle for human rights and political freedom in Poland. He was also able to travel widely, attracting support for the movement. His term as President was marred by internal rivalries including issues surrounding command of the military. However, Poland did make a successful switch from the state controlled to a free market economy and by the end of his term, the economy was booming, one of the healthiest among the new democracies of Central and Eastern Europe. He narrowly lost the 1995 election. 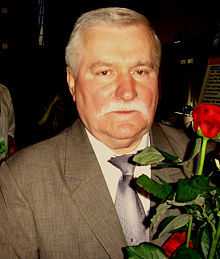 Wałęsa stood unsuccessfully for election in 2000 but supported another candidate in 2005. He has now retired from politics. In addition to the Nobel Prize and the United States Presidential Medal of Freedom he has received numerous awards and honorary doctorates. On the one hand, his Presidency was not an unqualified success. On the other hand, he remains the man whose face symbolized the hopes, dreams and aspirations of a whole nation during much of the 1980s. His gritty determination to achieve rights and freedom inspired many around the world. His commitment to non-violent protest, which helped to topple an oppressive regime, is a powerful reminder that even governments that do not hesitate to respond violently to peaceful protest cannot ultimately withstand the pressure of popular opposition and dissent. The concept of "Solidarity" that motivated Wałęsa movement was always conceived in broad terms as expressing a universal hope. As the chair of the Nobel Committee said, Wałęsa belongs not only to Poland but to the whole world. Wałęsa was born in Popowo, Poland, to a carpenter and his wife. He attended primary and vocational school before working as a car mechanic from 1961 until 1965 when he joined the army. In 1967, he left the army where he had achieved the rank of corporal and entered Lenin Shipyard in Gdańsk (Stocznia Gdańska im. Lenina, now Stocznia Gdańska) as an electrical technician. In 1969 he married Danuta Gołoś, and the couple now have eight children. His son Jarosław Wałęsa is a member of Poland's Sejm (lower house of the Polish parliament). Lech Wałęsa is a devout Roman Catholic, and has said that his faith always helped him during Solidarity's difficult moments. He was a member of the illegal strike committee in Gdańsk Shipyard in 1970 (Polish 1970 protests) and was briefly detained. In 1976, Wałęsa lost his position in Gdańsk Shipyard. He continued his union activities, supporting himself with various temporary jobs. In June 1978 he joined the illegal underground Free Trade Unions of the Coast (Wolne Związki Zawodowe Wybrzeża), organized by Bogdan Borusewicz, Andrzej Gwiazda, Krzysztof Wyszkowski, Lech Kaczyński, Anna Walentynowicz, Antoni Sokołowski, and others. On August 14, 1980, after the beginning of an occupational strike in the Lenin Shipyard of Gdańsk, Wałęsa became the leader of this strike. The strike was spontaneously followed by similar strikes, first in Gdańsk, and then across Poland. In September of that year, the Communist government signed an agreement with the Strike Coordination Committee to allow legal organization, but not actual free trade unions. The Strike Coordination Committee legalized itself into National Coordination Committee of Solidarność Free Trade Union, and Wałęsa was chosen as a chairman of this Committee. Solidarność is also known as Solidarity. Wałęsa kept this position until December 13, 1981, when he was arrested. General Wojciech Jaruzelski declared a state of martial law on December 13. Wałęsa was incarcerated for 11 months in south-eastern Poland near the Soviet border until November 14, 1982. In January, 1981 he had met with Pope Jean-Paul II in the Vatican, who expressed his support for the movement. Sponsored by the International Labour Organization he traveled widely, attracting support for the Solidarity movement. Lech Walesa has made the name "Solidarity" more than an expression of the unity of a group campaigning for special interests. Solidarity has come to represent the determination to resolve conflicts and obliterate disagreement through peaceful negotiation, where all involved meet with a mutual respect for one another's integrity ... Lech Walesa's contribution is more than a domestic Polish concern; the solidarity for which he is spokesman is an expression of precisely the concept of being at one with humanity; therefore he belongs to us all. From 1987 to 1990 Wałęsa organized and led, the "half-illegal" Temporary Executive Committee of Solidarity Trade Union. In 1988 Wałęsa organized an occupational strike in Gdańsk Shipyard, demanding only the re-legalization of the Solidarity Trade Union. After eighty days the government agreed to enter into talks in September. Wałęsa was an informal leader of the "non-governmental" side during the talks. During the talks the government signed an agreement to re-establish the Solidarity Trade Union and to organize "half-free" elections to the Polish parliament. In 1989, Wałęsa organized and led the Citizenship Committee of the Chairman of Solidarity Trade Union. Formally, it was just an advisory body, but, practically, it functioned as a political party, which won parliament elections in 1989 (the Opposition took all seats in the Sejm that were subject of free elections and all but one seats in the newly re-established senate; according to the Round Table agreements only members of the Communist Party and its allies could stand for the remaining 64 percent of seats in the Sejm). US President George H. W. Bush (right) and Barbara Bush (left) with Wałęsa (center) in Warsaw, July 1989. While technically just Chairman of Solidarity Trade Union at the time, Wałęsa played a key role in Polish politics. At the end of 1989, he persuaded leaders from formerly communist ally parties to form a non-communist coalition government, which was the first non-communist government in the Soviet Bloc's sphere of influence. After that agreement the parliament chose Tadeusz Mazowiecki for prime minister of Poland. Poland, while still a communist country in theory, started to change its economy to a market-based system. He was the second non-head of state to address a joint meeting of the United States Congress on November 15, 1989. He was also the first recipient of the Liberty Medal on July 4, 1989 in Philadelphia, Pennsylvania. In his acceptance speech, he said, "Liberty is not only a right, but also our common responsibility and duty." On November 13, 1989 he was awarded the Presidential Medal of Freedom by George H. W. Bush. Documents coming to light as of June 2008 allege that Wałęsa had been a collaborator of the communist secret police (Polish: tajny współpracownik) pseudonym "Bolek," well prior to the formation of Solidarity. Walesa himself denies any collaboration and there is no substantiation of these rumors. On August 11, 2000, the Appellate Court of Warsaw, V Wydział Lustracyjny, declared that Wałęsa's Lustration Statement is a true one, meaning he did not collaborate with the communist regime. On December 9, 1990, Wałęsa won the presidential election to become president of Poland for the next five years. During his presidency, he started a so-called "war at the top" which practically meant changing the government annually. His style of presidency was strongly criticized by most of the political parties, and he lost most of the initial public support by the end of 1995. After downfall of the Jan Olszewski cabinet on June 1992, and following the unveiling of a list of secret collaborators by Minister of Internal Affairs Antoni Macierewicz, Lech Wałęsa was allegedly linked with illegal prosecution and disintegration of Polish conservative and independent rightist parties (the so called Instruction UOP nr 0015/92). Relations between and the Prime Minister, Waldemar Pawlak were strained until the latter was removed not long before the 1995 elections. Partly, the strain was caused by internal party rivalries and by a degree of competition over who had command of the military. Wałęsa lost the 1995 presidential election. This was by less than 1 percent, a margin which many people considered would have been comfortably overturned if the revelation had come earlier that his opponent had falsely claimed to have a university degree—and used Wałęsa's lack of higher education as a political weapon. Calls for a new election were dismissed. However, during Wałęsa's presidency, Poland was successfully transformed into a market driven economy. It finished the five-year period with one of the healthiest economies of the newly independent former communist states. In the early 1990s, Wałęsa had proposed a as a subregional security framework. The concept, though supported by Polish right-wing as well as populist movements, and by politicians such as Leszek Moczulski, gained little support abroad, as Poland's neighbors, some of whom (like Lithuania) had only recently regained independence, tended to perceive the concept as imperialistic. After that, he claimed to go to "political retirement," but he was still active, trying to establish his own political party. In 1997 Wałęsa supported and helped to organize a new party called Solidarity Electoral Action (Akcja Wyborcza Solidarność) which won the parliamentary elections. However, his support was of minor significance and Wałęsa held a very low position in this party. The real leader of the party and its main organizer was a new Solidarity Trade Union leader, Marian Krzaklewski. Wałęsa again stood for the presidential election in 2000, but he received only 1 percent of votes. Many Polish people were dissatisfied with the fact that once again he wanted to regain his political power. After that, Wałęsa again claimed political retirement. From that time on, he has been lecturing on the history and politics of Central Europe at various foreign universities. Although no longer politically engaged, Wałęsa is still publicly addressed as President. During Poland's 2005 presidential elections, Wałęsa supported Donald Tusk, saying that he was the best of all the candidates. Simultaneously, he expressed support for Poland's newly-formed Democratic Party - demokraci.pl in the parliamentary elections of the same year. In 2006, Wałęsa quit Solidarity. In an Associated Press report, he cited differences with the party's support of the Law and Justice party, and the rise to power of Lech and Jarosław Kaczyński. On October 11, 2006 Wałęsa was the keynote speaker at the launch of the "International Human Solidarity Day" proclaimed by the United Nations General Assembly in 2005 at the United Nations Trusteeship Council. The Day, to be observed on December 20, aims to raise awareness of the importance of solidarity for advancing the international development agenda, especially for poverty eradication. In the Millennium Declaration, Heads of State and Government identified solidarity as one of the “fundamental values… essential to international relations.” Mr. Wałęsa received a long applause from the audience after delivering an emotional speech on the impact of the day in human relationships and how his own movement "Solidarność" succeeded in getting support from people from various countries. In January 2007, Wałęsa spoke at the event "Towards a Global Forum on New Democracies" in Taiwan in support of democracy and peace along with other prominent world leaders and President Chen Shui-bian of Taiwan. On May 30, 2007, Wałęsa received the title Defender of the Faith, Defensor Fidei, from the Italian Cultural Association. On February 27, 2008 in Methodist DeBakey Heart and Vascular Center, Houston, Wałęsa had a stent placed in his heart to open a partially blocked artery and had a pacemaker implanted. In 2008 historians from the Institute of National Remembrance (IPN), Sławomir Cenckiewicz and Piotr Gontarczyk published a book "SB a Lech Wałęsa. Przyczynek do biografii" ("Lech Wałęsa & SB") which claims that in the 1970s Wałęsa, was a secret informer of the Polish communist secret police—Służba Bezpieczeństwa under the codename "Bolek." The book includes documents as well as witness testimonies and focuses on the history of the documents which disappeared from Wałęsa's archived UB files in the early 1990s, when Wałęsa twice had access to them during his presidency. According to the authors, after Wałęsa returned the file, some documents were missing. Wałęsa confirmed seeing the documents but denied having taken them. Other anti-communist movement members of that time, including Andrzej Gwiazda and Lech Kaczynski have claimed Wałęsa did indeed collaborate with the SB in the 1970s. The evidence however is unclear and historians are divided. The book is seen as highly controversial, and many criticized it as an attack on a hero's reputation. Hayden says that such allegations are "easy to make" but "impossible to disprove" and that Wałęsa "sometimes played into the hands of the authorities" who for their part "quire frequently splayed into his". Trahair describes the evidence as fabricated and says that "forged papers" had been sent to the Nobel Committee in 1982 in an effort to discredit him. Walesa told the BBC that he "had no influence over what the secret police did and wrote." "You will not find any signature of mine agreeing to collaborate anywhere:, he continued." The allegations were "all insinuation and part of the communist secret service campaign against" him. On May 10, 2004, the Gdańsk international airport was officially renamed Gdańsk Lech Wałęsa Airport to commemorate the famous Gdańsk citizen. His signature was incorporated into the airport's logo. There was some controversy as to whether the name should be spelled Lech Walesa (without diacritics, but better recognizable in the world) or Lech Wałęsa (with Polish letters, but difficult to write and pronounce for foreigners, the closest English phonetic approximation being "Vawensa"). A month later, Wałęsa went to the United States representing Poland at the state funeral of Ronald Reagan. On April 25, 2007 Wałęsa represented the Polish government at the funeral of Boris Yeltsin, former President of the Russian Federation. In 2002, Wałęsa represented Europe in carrying the Olympic flag at the opening ceremonies of the XIX Olympic Winter Games in Salt Lake City, joining Archbishop Desmond Tutu (Africa), John Glenn (The Americas), Kazuyoshi Funaki (Asia), Cathy Freeman (Oceania), Jean-Michel Cousteau (Environment), Jean-Claude Killy (Sport), and Steven Spielberg (Culture). The path to a brighter future of the world leads through honest reconciliation of the conflicting interests and not through hatred and bloodshed. To follow that path means to enhance the moral power of the all-embracing idea of human solidarity. He has written about how faith that good would triumph over evil sustained him when the chances of success seemed slim. His belief in human dignity as a universal right is rooted in his conviction that all people are created in the image of the one God. He also resisted those who wanted to use violence, who argued that non-violent struggle had never succeeded against a communist regime. Believing that violence breeds more violence, Wałęsa consistently counseled non-violence. He later attributed success in Poland to a combination of negotiation and acceptance of gradual change, which he offers as a "model for other countries." He cites the Pope's prayer from August 1988 when he prayed for peace in Poland, for "a peace based on the stability of truth and justice, not on violence." because "we can effectively oppose violence only if we ourselves do not resort to it". His belief in human dignity as a universal right is rooted in his conviction that all people are created in the image of the one God. ↑ Egil Aarvik, 1983, Presentation Speech. The Nobel Foundation. Retrieved February 21, 2009. ↑ George Bush, 1991, at the Welcoming Ceremony for President Lech Walesa of Poland. The American Presidency Project. Retrieved February 21, 2009. ↑ Lech Walesa. Presidential Medal of Freedom. November 13, 1989. Retrieved February 21, 2009. ↑ Lech Walesa: History's Tentacles. The Economist. Retrieved February 21, 2009. ↑ Monika Wohlefeld, 1996, Security Cooperation in Central Europe: Polish Views. NATO. Retrieved February 21, 2009. ↑ "International Human Solidarity Day", UN. Retrieved February 24, 2009. ↑ Press Release. Ministry of Foreign Affairs, Tiwan. Retrieved February 21, 2009. ↑ Walesa leaves Texas hospital after heart treatment. Reuters UK. March 4, 2008. Retrieved February 21, 2009. ↑ R. C. S. Trahair, 2004, Encyclopedia of Cold War espionage, spies, and secret operations. (Westport, Conn: Greenwood Press. ISBN 9780313319556), 324. ↑ Adam Easton, 2008, Walesa Scorns collaborations claim. BBC. Retrieved February 21, 2009. ↑ Lech Wałęsa, 1983, Acceptance Speech. The Nobel Foundation. Retrieved February 21, 2009. ↑ Wałęsa and Rybicki 1992, 136. ↑ Wałęsa and Rybicki 1992, 4. ↑ Wałęsa and Rybicki 1992, 152. ↑ Lech Walesa, 1983, Nobel Lecture. Nobel Foundation. Retrieved February 21, 2009. Ascherson, Neal. 1982. The Book of Lech Wałęsa. New York, NY: Simon and Schuster. ISBN 9780671456832. Boyes, Roger. 1994. The Naked President: A Political Life of Lech Walesa. London, UK: Secker & Warburg. ISBN 9780436200557. Brolewicz, Walter. 1983. My Brother, Lech Walesa. New York, NY: Tribeca Communications. ISBN 9780943392523. Cenckiewicz, Sławomir, and Piotr Gontarczyk. 2008. SB a Lech Wałęsa: Przyczynek do Biografii. Gdańsk, PL: Instytut Pamięci Narodowej—Komisja Ścigania Zbrodni przeciwko Narodowi Polskiemu. ISBN 9788360464748. Craig, Mary. 1987. Lech Wałęsa and His Poland. New York, NY: Continuum. ISBN 9780826403902. Dobbs, Michael, K.S. Karol, and Dessa Trevisan. 1981. Poland, Solidarity, Walesa. New York, NY: McGraw-Hill. ISBN 9780070066816. Eringer, Robert. 1982. Strike for Freedom! : The Story of Lech Walesa and Polish Solidarity. New York, NY: Dodd, Mead. ISBN 9780396080657. Hayden, Jacqueline. 1994. Poles Apart: Solidarity and the New Poland. Dublin, IE: Irish Academic Press. ISBN 9780716525325. Kaye, Tony. 1989. Lech Walesa. World Leaders Past & Present. New York, NY: Chelsea House. ISBN 9781555468538. Kurski, Jarosław. 1993. Lech Wałęsa: Democrat or Dictator? Boulder, CO: Westview Press. ISBN 9780813317885. Wałęsa, Lech. 1987. A Path of Hope. London, UK: Collins Harvill. ISBN 9780002721202. Wałęsa, Lech, and Arkadiusz Rybicki. 1992. The Struggle and the Triumph: An Autobiography. New York, NY: Arcade Pub. ISBN 9781559701495. New Statesman interview with Lech Walesa by Mark Seddon. The Nobel Peace Prize 1983. BBC interview with Lech Walesa on the 25th anniversary of the founding of Solidarity. This page was last modified on 24 June 2018, at 22:56.